Chicago Hiked the Cost of Vehicle City Sticker Violations to Boost Revenue. But It’s Driven More Low-Income, Black Motorists Into Debt. 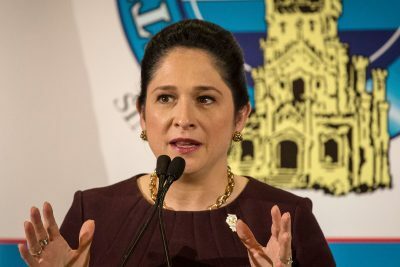 During negotiations for Chicago’s 2012 budget, newly elected Mayor Rahm Emanuel and then-City Clerk Susana Mendoza agreed to hike the price of what was already one of the priciest tickets vehicle owners can get in the city. Citations for not having a required vehicle sticker rose from $120 to $200. A ticket hike, Mendoza told aldermen, could generate $16 million a year for the city. That did not happen. The increase has brought in just a few million dollars more a year, while it’s unclear if it led to greater compliance. Sticker sales have been largely stagnant. But increasing the price of sticker tickets came at a devastating cost for thousands of Chicago’s poorest residents, particularly those from African-American neighborhoods, according to an investigation by ProPublica Illinois and WBEZ. Debt from this one type of ticket swelled, compounded by late penalties and collection fees. Collectively, drivers now owe the city some $275 million for sticker tickets issued since 2012. The penalty increase — coupled with a pattern of racial disparities in sticker ticketing — has exacerbated a uniquely Chicago phenomenon: Thousands of mostly black drivers filing for bankruptcy to cope with ticket debt. 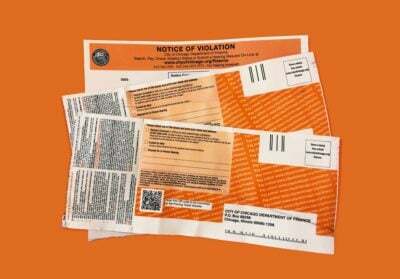 Sticker citations are the least likely of the city’s routine parking tickets to get paid, with only one in three tickets issued in 2016 paid within a year. Other frequently issued tickets, including $60 street cleaning citations and $50 expired meter citations, are cheaper and more likely to end in payment. Black neighborhoods are hit with sticker tickets at a higher rate, per household, than other parts of the city, according to an analysis of tickets from 2011 to 2015. Tickets issued by police drive the disparity. Tickets issued in more affluent, majority white neighborhoods are more likely to get dismissed, according to an analysis of 2017 tickets. That’s in large part because motorists from those neighborhoods appeal at higher rates than drivers cited in other parts of the city. Mendoza, meanwhile, expressed regret over her role in increasing the cost of sticker tickets at the expense of low-income black Chicagoans. Now state comptroller, she said the city should “revisit” the ticket prices and consider forgiving drivers’ ticket debt once they come into compliance with the sticker requirement. The decision to raise the fine was framed publicly as a way to pass the burden of paying for pothole repairs — which, along with other street maintenance, are financed with revenue from sticker sales — from “soccer moms” who drive large vehicles to “scofflaws” who don’t buy stickers or purchase them late. It was the fall of 2011 and Emanuel’s first budget. Years of borrowing and overspending from the administration of his predecessor, Mayor Richard M. Daley, had left Chicago in a perilous financial condition. The housing downturn, meanwhile, had led to a drop in some tax revenue. The city needed to find new revenue sources. Among the newly elected mayor’s proposals to narrow the deficit, he suggested cuts to libraries and mental health centers while increasing the prices for water service, garbage removal and some parking. He also proposed raising the cost of Chicago’s wheel tax — what’s known colloquially as the “city sticker” — for some large passenger vehicles from $75 to $135 per year. Heavier vehicles already paid more. Chicago’s wheel tax is unique among the country’s largest 15 cities. Some cities have fees that are tacked onto state vehicle registrations, but none are so expensive. Mendoza pushed back on increasing the cost of stickers, saying it was too steep and would hurt families that owned larger vehicles. One of the city clerk’s main jobs is to run the sticker program. She suggested instead that the city raise penalties for sticker “scofflaws.” Aldermen applauded her strategy and the Emanuel administration went along. The increase was included in the broader vote on the city budget, which the City Council unanimously approved. The cost of a sticker went up for all motorists, though not as much as initially proposed. Penalties for motorists who purchased city stickers late increased to $60, up from $40. The citation for not having a sticker went up 67 percent, to $200 — an amount that, with late penalties and collections fees, quickly can rise to $488 and become a financial burden for families. A lawsuit filed against the city last week alleges that these penalties exceed a state cap of $250. 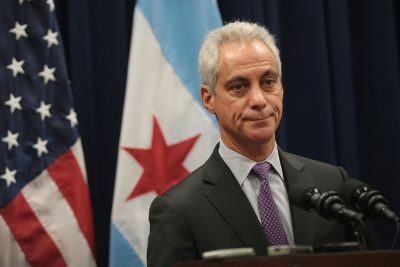 City officials have not responded to the suit, but have indicated that they will use Chicago’s “home rule” authority — a privilege that allows large cities to set their own taxes and fines — as a defense. Despite repeated questioning over several weeks, finance department officials would not say if they ran revenue projections or considered how a price hike would affect the city’s poorest residents before the ticket hike was approved. Kristen Cabanban, a finance department spokeswoman, said in a statement that hiking ticket prices was meant to “serve as a deterrent for scofflaws” and an incentive for motorists to purchase stickers. Sales have been relatively steady since 2008, at 1.2 million to 1.4 million stickers a year, according to records from the city clerk’s office. She projected a windfall in testimony at an October 2011 City Council budget hearing. Her projections appear to have been based on assumptions that everybody who gets a ticket pays it, and that the number of total citations is similar year to year. Both assumptions are false. Few motorists pay city sticker tickets, a trend that has held steady both before and after the price increase. From 2007 to 2016, the payment rate over 12 months remained about one in three. Meanwhile, the number of sticker citations issued annually ranges between 200,000 and 250,000. Police, finance department parking enforcement aides, investigators from the clerk’s office and private contractors all write tickets. In years when the number of sticker citations were similar, revenue increased by a few million dollars. About 200,000 tickets were issued in both 2011 and 2014, for example, and revenue increased from about $21 million to $25 million. There were also similar numbers of tickets issued in 2007 and 2015 — about 250,000 tickets. Revenue jumped from about $25 million to $32 million. Over time, those amounts can be expected to grow as more drivers pay their tickets. Meanwhile, debt has skyrocketed. Drivers owe the city about $16.8 million for unpaid sticker tickets, late fines and collections fees from citations issued in 2011. They owe nearly twice that amount for unpaid tickets issued in 2012. And that debt keeps climbing. Unpaid sticker tickets have contributed to an explosion in Chapter 13 bankruptcies in Chicago, a trend ProPublica Illinois reported on earlier this year. These citations, according to the city’s ticket data, represent one in four tickets connected to bankruptcies. Indeed, most bankruptcies tied to unpaid tickets fail as debtors are unable to keep up with required monthly payments. Bankruptcy firms routinely alter the terms of Chapter 13 payment plans in order to ensure their legal fees are paid first, a practice that has recently come under scrutiny in Chicago. City officials say they want indebted drivers to get on municipal payment plans instead of filing for bankruptcy. “Early enrollment in the City’s payment plan, where fines, penalties and accrued interest can be avoided, is open to all motorists - even those who have only received one ticket,” Cabanban said. However, motorists with substantial ticket debt who have lost their driver’s licenses or vehicles because of unpaid tickets are required to pay $1,000 or more to sign up for a monthly payment plan. That down payment can be a barrier for thousands of drivers who file for bankruptcy protection to restore their driving privileges. Last month, ProPublica Illinois and WBEZ reported on how the city has, on some 20,000 occasions over the past decade, issued multiple city sticker tickets to the same vehicle on the same day. Those duplicate tickets were disproportionately issued in black neighborhoods. Those disparities are evident in a broader analysis of where sticker tickets are handed out. ProPublica Illinois and WBEZ mapped the 1.1 million sticker citations issued between 2011 and 2015 and found more citations were issued, per household, in low-income black neighborhoods than anywhere else. Of Chicago’s 77 community areas, North Lawndale, West Englewood and West Garfield Park had the highest rates of sticker tickets — at least 10 times higher than in majority white, more affluent neighborhoods such as Forest Glen, Edison Park and Norwood Park, where the rates are lowest. City officials have offered varying explanations for the disparities. A spokesman for the police department said officers check for city stickers during traffic stops. Finance department officials, meanwhile, said their staff may issue more sticker tickets in South and West side neighborhoods because those areas have fewer parking meters or residential parking zones — meaning there are fewer other kinds of tickets to issue there. Another explanation for the disparities: More motorists in low-income black neighborhoods simply don’t have city stickers. An analysis of sticker sale data from 2017 does show slightly more late sticker purchases in black neighborhoods, when compared to other parts of the city. The data doesn’t offer a complete account, however, as motorists who never bought stickers are simply left out. Mendoza said she knew at the time of the debate that many low-income Chicagoans struggled to buy vehicle stickers. While the city offers a discounted rate for senior citizens, no such discount is available for low-income residents. What’s more, she said, many middle-class and more affluent residents who don’t buy stickers can avoid getting caught more easily than low-income residents because garages are more prevalent in more affluent neighborhoods. Ald. Gilbert Villegas, of the Northwest Side’s 36th Ward, said he’s been troubled by the reporting from ProPublica Illinois and WBEZ on ticket debt, bankruptcies and enforcement disparities. He said he’s been looking into policy solutions but has not found an answer. Villegas was first elected in 2015, after the decision to raise the penalty for the city sticker citation. But he said he’s probably voted on other occasions to increase fines and fees without considering how they may affect the city’s poorest residents. If you have any ideas or tips, email us at [email protected] and [email protected]. ProPublica Illinois reporting fellow Jerrel Floyd, news applications fellow Katlyn Alo and news applications developer David Eads contributed to this story.